Lake Oswego must be doing something right. This Friday, November 29, marks the 49th Annual Tree Lighting beginning at 5:00 p.m. at the corner of 5th Street and A Avenue in front of the Bigelow Plaza Holiday Tree. Festivities continue as a parade winds its way down A Avenue to Millennium Plaza Park at the corner of First and Evergreen for the lighting of the Millennium Tree. While live carolers will be in full force from Lake Oswego High School’s Windjammers to Lakeridge’s Company, you might want to “warm up” for this event with a playlist of your own. “O Christmas Trees(s ).” The giant Sequoia in the Safeway parking lot is a beacon during the holidays, heralding the season to anyone heading up or down A Avenue. Since the tree was deemed too high for stringing traditional bulbs several years ago, glistening snowflakes now do the job . With the addition of Millennium Plaza Park as the city’s social hub, it made sense to initiate some of the festivities there so an additional tree lighting was added to the traditional one and now Lake Oswegans get to witness two trees going up in lights the Friday after Thanksgiving. “Santa Claus Is Coming to Town.” Parental warning attached: you may have to do some explaining to your young children why Santa Claus arrives in Lake Oswego on a fire engine instead of a sleigh, but he will be there, ready to listen to your little one’s wish list and spread his holiday cheer. “It’s Beginning to Look a Lot Like Christmas.” In case the Christmas tree lights and jolly fat man in a red suit weren’t enough of a clue that in 24 hours the season has changed, the candy canes, Santa hats and holiday sweaters will remove any doubt. Revel in the season, browse the downtown shops decked out in their holiday best, grab a hot chocolate, and give thanks you live in a town that knows how to celebrate. “Rockin’ Around the Christmas Tree.” The sights of Christmas are one thing. The sounds are another and they will be plentiful at this event, including the Millennium Concert Band, Lake Oswego High School’s Windjammers and Lakeridge High’s Company performers. Grab the family and head over to the Adult Community Center which will serve as the boarding place for horse drawn carriage rides through the First Addition neighborhood this Saturday, November 30 from 11:00 a.m. to 3:00 p.m. Cost is $3 for adults 18 and over; $2 for youth. 505 G Avenue. 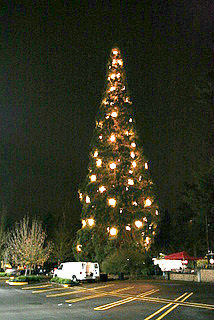 This entry was posted in Seasons in Lake Oswego Oregon, Things to Do in Lake Oswego and tagged Lake Oswego Annual Tree Lighting. Bookmark the permalink.